When my clients, the buyers of this lovely estate, asked me to find them a home with several acres, near the center of the City, and not too far from the Polo Fields, I had to scour the East Valley. But..we got in to see this amazing property at 42605 Byron Pl, Bermuda Dunes, BEFORE it came on the market! We wrote immediately and 10 days later, my Seattle, Washington clients are working their magic on their new home. 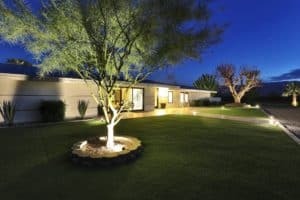 If you are thinking of buying a home in the Palm Springs Valley, it really helps to have a detailed list of your “must-haves” We all come prepared to buy with a Wish List, but educated Buyers also know that they are going to have to compromise, (unless your budget is virtually unlimited!) The most important things to really be clear about..
1. Location. Which City in the Palm Springs Valley are you focused on? 2. Budget: Stick to it! Don’t out house yourself. 4. Gated or non-gated? Her in our Valley, this is a biggee as you don’t want to forget to budget in your HOA dues. 5. What do you like to do? Golf, Equestrian, Tennis, hiking, theatre, art, museums? Think about it. Style of home, colors, layout..these can be altered, but LOCATION cannot. If you’re looking to buy a home in the Palm Springs Valley, give me a call at 760-285-3578. Palm Springs Valley; an Equestrians’ Dream! When most people think of the Palm Springs Valley, they think of Sunshine and Golf. People with horses know if for entirely different reasons, but equally important and impressive. The Eastern end of the Palm Springs Valley encompasses the cities of La Quinta, Indio, Bermuda Dunes, Coachella, Thermal and Vista Santa Rosa. Each is home to many horse ranchettes, small horse estates, actual working ranches and producing date and citrus farms. Indio has become famous for it’s two International Polo Clubs, The Empire Polo Club and the Eldorado Polo Club. Eldorado is celebrating it’s 55th year of life in 2012! Eldorado moved to it’s current site in the 1980’s and is the largest Polo Club in the United States. Florida with it’s many private clubs as well as the Palm Beach Polo Club is it’s only rival. There are 13 polo fields, and each season welcomes approximately 1,000 horses and 150 players. Sunday games are open to everyone, with tailgate parties, jumpy gym for the kids, hot dog stands and more formal dining at the Clubhouse if preferred. Entry is $5/car..pretty reasonable for an afternoon of fun. Sunday’s Finals are played at 12 pm and 2 pm from January through April. The neighboring Empire Polo Club is on the map for different reasons entirely. Polo is played throughout the season with 5 fields and games 5 days a week, as well as a summer polo pony training haven. Empire Polo is geared more to Events, with it’s varied event sites including Medjhol Lake, the Famous Rose Gardens with it’s life size bronzes scattered throughout, a regulation size Indoor Polo Arena under lights for those night games, as well as wedding and celebration sites. But the BIG EVENT at Empire is the Coachella Music and Arts Festival in April. 2012 will be 10 years here in the Valley and it has become an international success, bringing visitors from all over the world. 2012 will see 3 weekends of the Music Festival. If you travel a little further East, you enter the town of Vista Santa Rosa. An unincorported, gorgeous, rural area of date palms and ranches, it is home to Deer Creek Polo Farm and many other polo pony training facilities. Adjacent to VSR is the very rural city of Thermal. Thermal was put on the map when The Jacqueline Cochran Airport opened, but it has become very famous amongst equestrians over the past years as home to the HITS (Horseshow in The Sun) competitions. This internationally ranked “A” rated horseshow has riders from all over the US and Canada competing for BIG cash prizes. Saturday and Sundays from January through April hosts day and night jumping events that will take your breath away. A small fee at the gate and you can stay all day. Equestrian shopping is unbeatable, the food is varied and the events go from children’s classes to Olympic level. 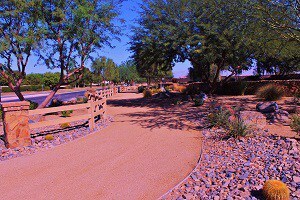 La Quinta also sports riding trails from it’s Eastern side to the more central areas. It is planed that the trails (which are also great for walking!) will eventually go all the way to the La Quinta Cove foothills. It is not unusual to see riders as you drive your car around La Quinta. So..come on out for the sunshine and golf, but add a few Equestrian flavored events to your schedule. You’ll be glad you did!